Thanks much to TLC reader Rachezee, we now have a detailed report from tonight’s test screening of “Harry Potter and the Half-Blood Prince.” As mentioned previously, there are details regarding Harry and Ginny’s kiss, as well as new descriptions of Slughorn’s memory and Riddle’s Horcruxes, Weasley Wheezes, Luna and the Quidditch commentary, the new scene written for the movie about the Death Eaters attack on the Burrow, and pivotal and dramatic scenes involving Snape, Draco, Sectumsempra and much much more. Caution: MAJOR SPOILER WARNING, scroll down for the full report below. Today I got to see the test screening of Harry Potter and the Half-Blood Prince. It took place in Chicago at the AMC River East. It was a secret screening, no one in the audience was supposed to know before hand what they were seeing. I was one of only a small handful who already knew what we would be seeing, but I was sworn to secrecy. It was truly the hardest secret I ever had to keep. It was not entirely complete, however aside from a few blue screens in the background, and one or two special effects missing, it was barely noticeable. I am a huge fan of Ginny and Harry so I will start with them. There is a lot more Ginny than ever before. She nearly equaled Ron for screen time. We first see her at the Burrow when Harry arrives outside and the first thing he sees is her reading through the window. Harry Just stands there for a moment, gazing up at her. Although she is dating Dean Thomas she never looks happy with him, except when she is snogging him at The Three Broomsticks. She was on the Gryffindor Quidditch team. But the only game we saw was from the Felix Felicis chapter when Ron believes Harry has slipped him the potion. During Christmas at the Burrow, Ginny and Harry wind up on the stairs alone and start to lean into each other to kiss, when the attack on the Burrow interrupts them. The Burrow does not burn down, but it is surrounded by a ring of fire conjured by Bellatrix. Harry, seeing Bellatrix, runs after her, and Ginny runs after him, right into Greyback. But Harry comes to the rescue and the two of them stand in a very high growing cornfield fending off attacks from the deatheaters. Lupin and Tonks come to the rescue, but that is I believe the last we see of them. There is no Tonks and Lupin relationship and although Tonks’ hair is brown there is no notice taken or any explanation given. Tom Felton did a fantastic job in this film. Draco character remains true to the book, he even stamps on Harry’s nose. But, sadly, we never get the pleasure of seeing Crabb and Goyle disguised as girls. In fact, they are hardly in this movie. The Sectumsempra scene was really good, even without moaning Myrtle. As Harry and Draco throw spells at each other poor Nigel sits frozen on one of the toilets. Snape runs in shortly and McGonagall is in the doorway after Harry cast the spell (Draco never yells Crucio) and he does do a cure his wounds with a spell that sounds almost like song. But he does not use legilimency on Harry, who runs straight out of the bathroom to McGonagall. In the next scene Hermione and Ginny band together and tell Harry to hide the potions book so not even Harry can find it. Ginny takes Harry to the room of Requirement, and makes him close his eyes while she hides the book. Then she kisses him briefly. By the time he opens his eyes she has vanished. There was definitely tension between Ron and Hermione. In the very beginning at the Burrow, Ron cleans off a bit of toothpaste from Hermione’s cheek. Later in Slughorn’s class she describes what she smells in the love potion and trails off with “spearmint toothpaste¦” Lavender is quite nauseating and although she never gives Ron a necklace she does something equally as vomit worthy, steaming up a window on the Hogwarts Express with her breath and drawing a heart with “R + L” inside it. His relationship ends when he is unconscious and moaning Hermione’s name after being poisoned. He remains confused about why it ended but very relieved. The kid who played young Tom Riddle was Brilliant. His voice and demeanor raised the hairs on the back of my neck. There is no mention of the Gaunts, but the scene in Slughorn’s office is there. Dumbledore however is truly surprised to learn that Riddle made 7 Horcruxes. It is in that scene that he realizes the ring is a Horcrux. He realizes what it was because when harry handles it briefly he moved his head like Voldemort. 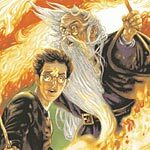 We do get to hear Hagrid and Slughorn singing about Odo the Hero, and Harry is funny and a few lines where true to the book while under the influence of Felix Felicis. There is no Professor Trelawney, or the Dursleys. No Kreacher (no mention of inheriting Grimmauld Place whatsoever) or Dobby, or Bill and Fleur. There are no scenes with the Minister of Magic, and I don’t believe they even mentioned Fudge was sacked (though I may have missed it). Oh and most sadly of all, no description from Luna about the dangers of the Rotfang Conspiracy. Nor does she commentate the Quidditch match. Luna’s role was very small, but she does have the lion hat and she is the one to find Harry on the train under the invisibility cloak with the help of her Spectrespecs. Weasleys’ Wizard Wheezes was awesome!!! I only wish it were a real store. Unfortunately no U-No-Poo sign, but it was still a sight to see. As a huge fan of the books I have found myself getting more and more disappointed by all the changes in the movies and especially in Michael Gambon’s portrayal of Dumbledore who is my favorite character. That being said I was really pleasantly surprised by this movie. Many of the changes were actually entertaining and Gambon has improved enough to be tolerable. It was so much better than Order of the Phoenix. Overall I really enjoyed this movie and can not wait to see it again.